Our 2 seater aluminium bistro sets are all subject to free delivery. Forget about extra costs on the checkout page. Find the bistro table and chairs set that's right for you, and we'll take care of delivery at no extra cost. For more details, visit our delivery information page or by all means give us a call. Our friendly team will be more than happy to walk you through the delivery process. White garden furniture is popular choice among our customers. It can really brighten up your garden or patio and make it a more inviting place to be. Our 2 seater white garden furniture is made of cast aluminium, making it both durable and weatherproof. Cast aluminium garden furniture does not rot or rust, making it a superior material for outdoor furniture than other materials. Wood needs maintenance (sanding, coats of waterproof paint) to stop it from rotting or splitting. Cast iron and other metals too (weatherproof metal paint, furniture covers). This maintenance means extra costs and less time for you to enjoy your garden. Invest in one of our 2 seater aluminium garden tables and leave those worries behind. 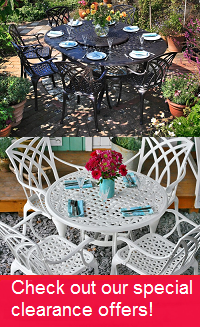 A cast aluminium garden bistro table and chairs from Lazy Susan can be left outside all year round. Your 2 seater metal bistro table won't rust, nor will it rot, warp or split. Look through this selection of 2 seater garden tables in white, and find the perfect one for you. The Rose bistro set is a stylish round 2 seater garden table featuring a beautiful Rose design on its 65cm wide table top. It weighs just 14kg, so moving it around the patio to find the perfect place for it is easy. The Tulip bistro set includes a chic table with gorgeous, detailed metalwork in the table top and two bistro chairs with a matching design. This white 2 seater garden table has a diameter of 60cm. If what you're looking for is more of a garden coffee table and chairs, take a look at the Claire table. This 2 seater rectangular garden table set consists of an attractive coffee table and either two chairs or a choice of the Rose bench or April bench. The table measures 110cm by 55cm. Our other piece of rectangular 2 seater garden furniture is the BBQ table set. It has the same triangular lattice design as the Claire table and is the same length and width. Where the two differ is in height, with the Claire table standing 49cm tall, and the BBQ table set at 73cm. The BBQ table set comes with 2 chairs or a choice of the Rose or April bench. Our last recommendation is the Mia table, our garden furniture set with the largest table diameter. The table, with its superb expanding lattice design, measures 90cm across and has a hole in the centre for a parasol. You can pair it with one of a number of chairs. Your white garden table and chairs will be much more enjoyable when enhanced with a few accessories such as cushions and a parasol. Underneath the section where you choose your chairs, you’ll find offers for cushions and parasols in various colours. Purchasing these in combination with your garden furniture set allows you to save 70% on them compared to buying them separately, so don’t miss out! Those aren’t the only available offers. You can also get between 20% and 80% off various aluminium garden furniture items such as a wide table or sun lounger. But these offers will be unique to this page, so combine them with your main order to take advantage. We have some outstanding deals on our clearance page, too. These standalone deals apply to everything, from side tables to 12 seaters. They change all the time, so check back often, and if you see a bargain on something you like, get it while you can! Please show us your new metal garden furniture to help us raise money for our Do Some Good charity campaign. Just take a few photos and share them on Facebook or Instagram with the tag @LazySusanFurniture or email them to us. We donate £10 for any set of photos of Lazy Susan furniture in your garden. We’ll donate £20 for photos including friends and family during a family lunch or BBQ. Your help goes a long way.